My name, knowcrazycom, translated into Japanese is: Nokkurachikamu. Below is the picture showing english pronounciation of Japanese (katakana) language. Below is the picture showing a table of pronounciation converting the english alphabets to japanese pronounciation. So if your name is Devharsh then in japanese it is Te-Ku-Ru-Ri-Ka-Shi-Ari-Ri. 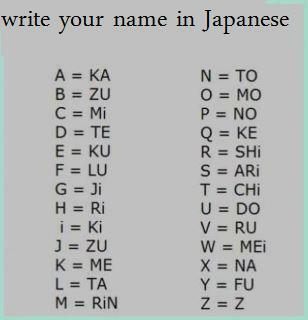 Try out your name and comment it.